With temperatures diving into the low 40’s, it’s safe to say that fall has officially decided to stay! What better way to enjoy the cool, crisp weather than to visit some fun Loudoun destinations! Check out these events happening all across Loudoun County this weekend and don’t forget to use #LoveLoudoun as your hashtag! Spend the weekend taking a free, self-guided tour in the beautiful countryside- no tickets required and fun for the whole family! Enjoy animals, meet local producers, and appreciate special products of Loudoun County’s agricultural lands! If you share photos, please use hashtags #LoveLoudoun and #LoudounFarmTour. All weekend long, enjoy lunch and drink specials at Döner Bistro. Be sure to bring your dancing shoes to dance to an authentic German band and traditional Bavarian music. Show off your Dirndl or Lederhosen and get a surprise gift! Free cotton candy for children to enjoy on Saturday, October 21st from 12-3 p.m.
Join King Street Oyster Bar & War Shore Oyster Company at Breaux Vineyards this weekend for a harvest celebration! 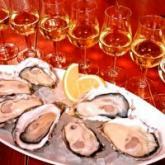 Over 15,000 oysters and 6 different varieties will be served! You can also enjoy an oyster and wine pairing where 3 wines will be paired with 6 different oysters in a seated tasting experience, teaching you how to perfectly pair wine and oysters!